AfterCollege launched in 1999 as a simple job board for entry-level positions. In spite of a bubble burst and more than a decade in between, the company soldiered on, staying afloat (and profitable) thanks to revenue generated from charging employers to post jobs on its site. With a plethora of job sites out there to choose from, like CareerBuilder and Indeed to name two, AfterCollege has managed to attract and retain a steady flow of paying customers because it works closely with individual academic departments within universities, allowing employers to target job postings to students who will actually find the postings relevant. While LinkedIn has traditionally appealed to an older user base, it has been stepping up its efforts to appeal to the younger crowd with a tool that allows students to plan their career path and student profiles. But AfterCollege still believes it has a beat on the professional networking giant and is today relaunching as a free networking platform specifically for college students and recent graduates. The company is currently seeing over three million students use its platform and sorting algorithms to search through job listings every year and has connected users with some half a million entry-level jobs and internships. As such, with its new networking layer, the company is leveraging its relationships with over 16,000 academic departments at 2,300 colleges and universities and over 20,000 employers to enable students to receive recommendations, advice and job opportunities from classmates, alumni and employers. 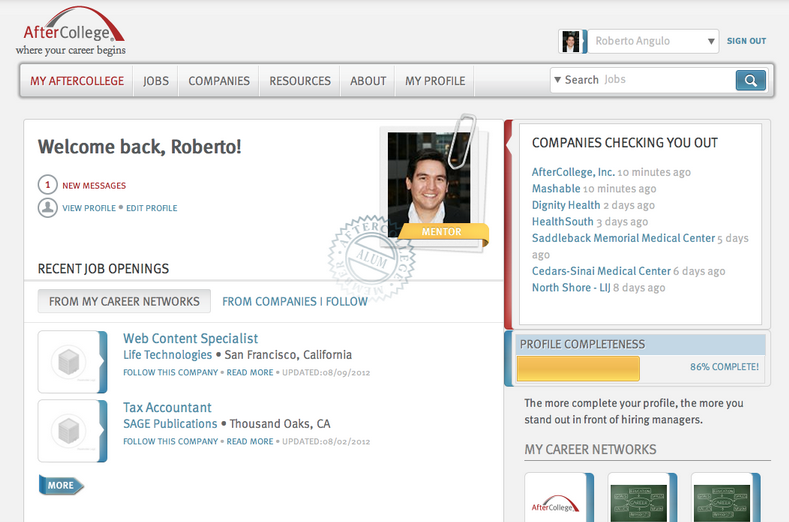 Rather than search for contacts and connections or vie for job opportunities with those who have been in job market for years like LinkedIn, AfterCollege automatically connects students with those in their network and uses its job-matching algorithm to pair job seekers to opportunities that fit their academic focus and skills. The idea being to provide students with jobs that are relevant to their school, department and careers — without requiring significant work experience. Specifically, the algorithm takes a user’s academic affiliations (school, educational program/department, groups) and matches relevant opportunities to them. Most matching algorithms match on an individual user’s preferences. Ours can match based on a user’s preferences, BUT the distinguishing factor is that it matches on a group of users. For example, we’re matching relevant jobs and internships to users based on the collective group’s background (e.g. academic department). This is great for students because it exposes them to opportunities that are very relevant but at the same time, opportunities that they themselves may not have thought about, but that others in their group may be relevant for or may have applied for. This gives the user exclusive jobs while also letting them discover new types of opportunities. The algorithm can also distinguish between different programs that may be perceived to be similar. For example, the Computer Science department at San Francisco State may have different specialties than then Computer Science department at Stanford. While at Stanford CS, Human Computer Interaction may be a strong skill set among students, at SFSU CS the strong skill set may be more Java, or social applications. The new networking features also, naturally, allow users to build a professional online profile (some 800K have already been created) and use the site’s resume and cover letter builders to get the ball rolling on the job search before crossing the stage to receive their diploma. Most students in school or graduating don’t have professional networks and so building a LinkedIn profile is pointless. If you don’t have any work experience or anyone to connect to, why bother? Angulo believes that most students don’t even realize they have a significant network within their academic context that they can use to their advantage — or even if they do, alumni directories often just provide contact information and basic data without giving students the opportunity to use them to build a network. Under its new look, students can now use AfterCollege to automatically connect to classmates, professors and administrators within the school. Up to this point, the platform has focused more particularly on STEM and health-related job opportunities and has really existed as an unstructured network built on top of these job listings. Incorporating networking into its existing jobs platform adds that social element students have grown familiar with on Facebook and through growing professional networking sites like BranchOut and Identified. Having more readily available information about students, their interests and concentrations is also helpful to employers, who can then tailor their postings accordingly or reach out directly and begin networking with students who fit the bill. AfterCollege’s relationship with over 16K departments led to the startup raising a sub-million-dollar round of seed funding from Flywheel Ventures to build out this network. 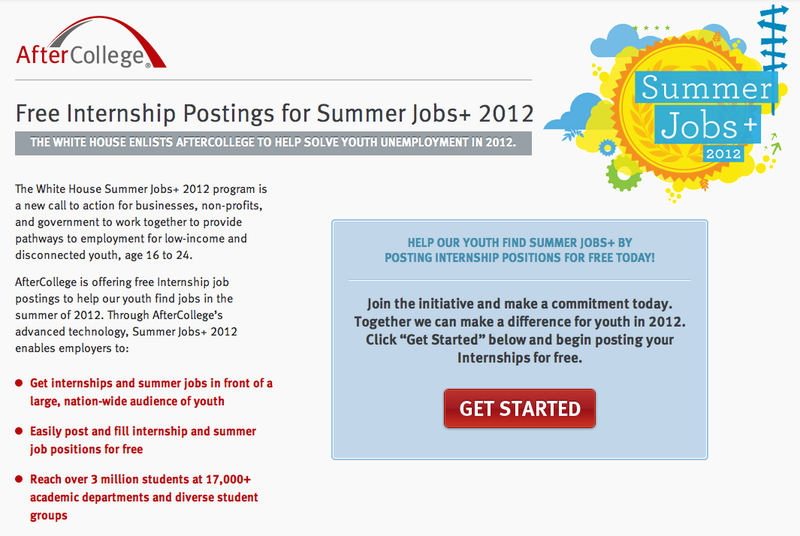 It also led to an alpha partnership with Summer Jobs+, an initiative spearheaded by the White House that seeks to connect younger generations (the most underemployed population) with some 250K summer and entry-level jobs — or at least that’s the goal. AfterCollege helped the White House get its “Job Bank” or job postings portal established, along with LinkedIn and Internships.com. AfterCollege has established a profitable business that’s been able to survive through the years thanks to its sizable database and network of targeted job postings and opportunities. It still has a long way to go in contrast with the fast-growing and well-funded efforts of BranchOut and Identified, which are ahead of it on the networking front. That said, the team believes that focusing on the college and recently-graduated demographic (and the networking, jobs search hybrid model) will provide it with enough differentiation to keep it moving forward. But if LinkedIn continues adding functionality geared towards younger users and keeps recruiting students at the rate it has been recently, it’s going to remain a tall order.